Do you know anyone who doesn't have magnets on their fridge? This gift is one of our most popular items. 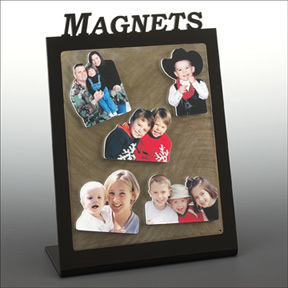 Your magnet can be made from any photo, or even an image of your child's handprint or footprint. Available in two great sizes. Got several of these magnets as gifts for people over the years, they are amazing! 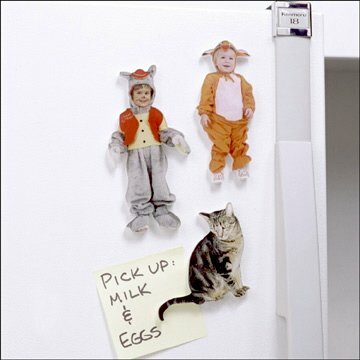 We have been ordering the fridge magnets since 2005. I get two every year of my kids in their Halloween costumes so we now have 23 that are just costumes! we have a few other random ones that are not costumes. They are the best quality. We only buy the 3x4 size so they are all uniform. Can't say enough good things about these!! I'm very pleased with my fridge magnet. It's laminated so I'm not afraid it's going to get ruined if I accidentally splash something on it. The colors look great. They did a great job cropping out the background. I ordered 3 5x7 magnets with what I thought to be too intricate of cuts, but they turned out beautiful! I was nervous that I wasn't able to preview before placing the order. I am very happy with how they turned out. The cutout photo magnets of my son were a gift for Father's Day for my husband and the grandpas. They were very well received and other family members have been jealous now that they've seen the magnets :). I'm thinking it'll become a tradition, with a pic of my son each year as he grows up. Thanks to FotoArt for the great customer service!